Our Bible lessons for kids come with sound teaching, straight from God's word, and some fun, engaging activities to keep your students attentive. Learning the Bible can be fun! Here's a peek at the coloring page. (It will make a lot more sense when you read the entire lesson!) 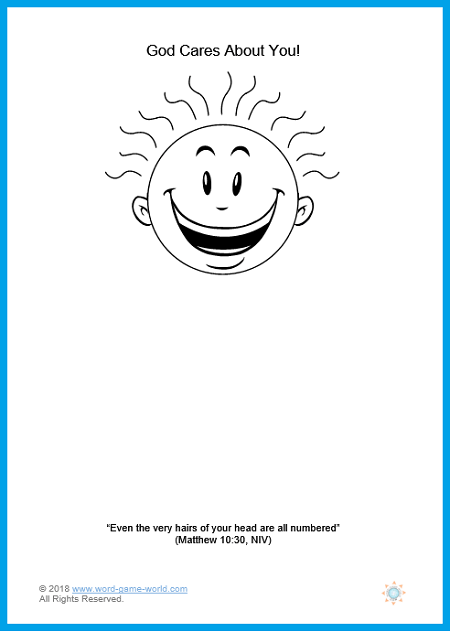 Find the Printable Lesson and Coloring Page here. The text of the lesson also appears below. Lesson: Today we’re going to talk about counting, and we’re going to talk about how much God cares for us. Let’s look at the jar of buttons first. Could you count all those buttons? I’m sure you could, especially if you dumped them all out on a table first. It wouldn’t take you very long. Could you count all the rubber bands in this big jar? That would take a lot longer, but I’m sure you could do that, too. Now look at this small jar of sand. Each little speck is called a grain of sand. Could you count all the grains in this jar? That would be very hard. What about all the grains of sand in all the beaches in the whole world? That would be impossible! But God already knows how many there are! Now look at this hairbrush. Did you know that every time you brush your hair you probably lose several hairs? Every day, hair comes out and new hairs grow in. Do you think you could keep track of that number when it changes so often? No, probably not. But God knows! Not only does he know about the sand in the beaches, but he knows all about things right in your own body—because he loves you and cares about you very much. You may have noticed that some people have a lot of hair, and some people don’t. Many times men become bald as they get older. (Let me tell you a secret. Women lose their hair sometimes, too!) People of any age may lose hair because of medicines they have to take. No matter the age of the person, losing your hair can be upsetting! God cares about me so much, he already knows how much hair is on (or isn’t on!) my head. And he is going to take care of me, even if all my hair falls out! He knows how much hair is on each one of your heads, too! Isn’t God amazing? Children, think about how much God must care for us when he keeps track of even the number of hairs on our head! Don’t you think he also cares about our problems? If time allows, ask children to help you list things that God cares about. Close in prayer, thanking God for his detailed care for each one of us. 2) Draw the rest of the kid’s body, and add more hair, if desired. Jesus Does Amazing Things - Set of 5 wonderful coloring sheets about the life of Christ, and a reminder that Jesus can do amazing things in the life of your child! Bible Coloring Sheets - Set of three unique pages in which kids will finish writing important Bible verses, finish drawing the picture, and finally color the page. Fun Bible lessons for kids! Color the Bible Verse Game - Here's a simple, fun new game in which kids compete to color Bible verses, letter by letter. Jesus Feeds a Crowd Kids will enjoy this activity as they learn about the famous Bible story from Matthew 14.